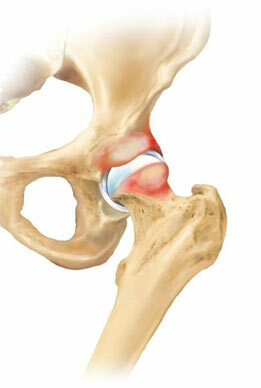 is a hip problem affecting your life? An exercise program may be prescribed to strengthen the muscles in the hip joint and in many cases improve positioning of the hip and relieve pain. Non-steroidal anti-inflammatory drugs, or NSAIDs, may help treat inflammation and pain in the hip joint temporarily. Please note, however, that all medications have risks and should only be taken under the direction of your doctor. Corticosteroids are a type of medication containing steroids, and are used to reduce inflammation and relieve pain. They can be taken orally or can be injected directly into the joint. Please note, however, that all medications have risks and should only be taken under the direction of your doctor. Hip arthroscopy [ahr-thros-kuh-pee] is an established form of keyhole surgery that is widely available and an important treatment option for those patients experiencing hip pain and/or discomfort (or related groin pain which can often be a sign of problems with the hip joint). The hip joint is one of the most ‘buried’ joints in the body, and simply getting access to the hip joint has been difficult until recently. Open surgery involves cutting through the surrounding muscles in order to locate and treat common hip problems. In a hip replacement or resurfacing operation, the surgeon replaces the damaged surfaces of the joint with artificial parts – which may be made of metal, plastic or ceramic materials2. Total hip replacement is not recommended in younger patients, as artificial joints tend to wear out and require replacement3.